The actor Suketakaya Takasuke IV as Sakuramaru from a fine set of prints showing actors glimpsed through their dressing room sliding doors, prior to going on stage. Their figures partly silhouetted as are their assistants, here aiding the actor with his sword. From a set Gakuya nikai kage no hyoban, “Popularity of the Upstairs Dressing Room.” The set published by Takagawa Fusajiro, 1883. Fine impression, colour and condition. Full size. Signed Toyohara Kunichika hitsu. 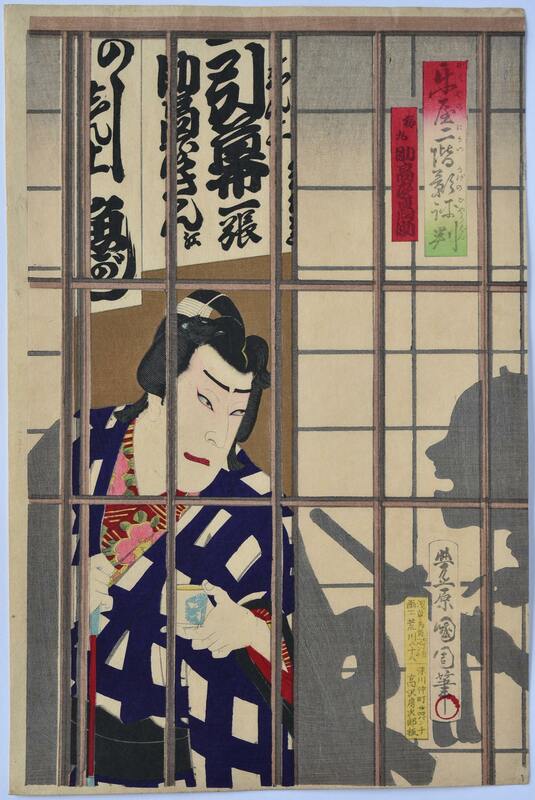 The actor Onoe Kikugoro V as Hisayoshi from a fine set of prints showing actors glimpsed through their dressing room sliding doors, prior to going on stage. Their figures partly silhouetted as are their assistants, here aiding the actor with his costume. From a set Gakuya nikai kage no hyoban, “Popularity of the Upstairs Dressing Room.” The set published by Takagawa Fusajiro, 1883. A dai-oban print showing the actor Ichikawa Danjuro IX as Minister Kibi in the play Kibi Daijin Shina monogatari, “Minister Kibi, Tale of China.” The play centres on the historical minister Kibi no Makibi who joined a mission to the Tang Court in China in 716. He is supposed to have brought back to Japan the game of go, embroidery, and the secrets of the Chinese almanac. Published by Gusokuya Kahai, 1875. Fine impression with gauffrage and extensive burnishing to Kibi’s black garment. Fine colour. Light album backing, otherwise fine condition, untrimmed. 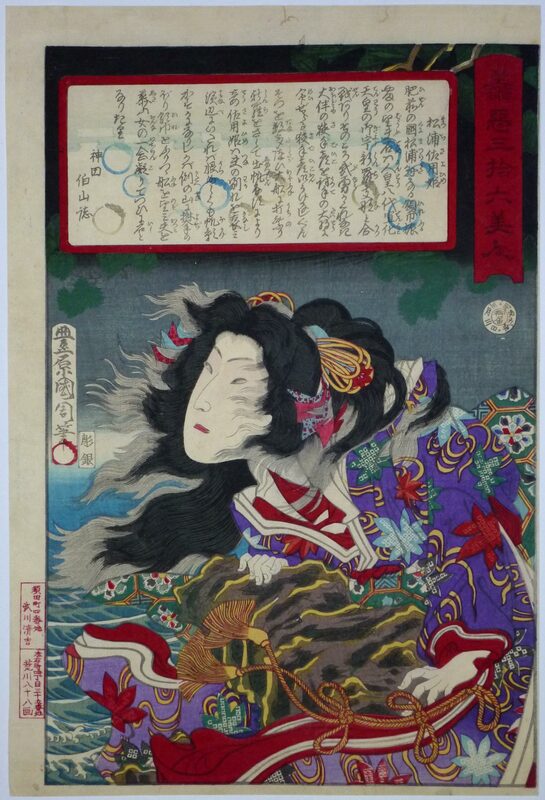 Signed Oju Toyohara Kunichika hitsu. 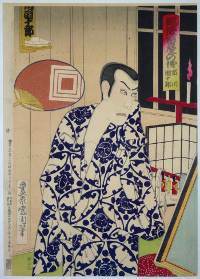 The actor Onoe Taganojo II from a fine set of prints showing actors glimpsed through their dressing room sliding doors, prior to going on stage. Their figures partly silhouetted as are their assistants, here aiding the actor with his headpiece. From a set Gakuya nikai kage no hyoban, “Popularity of the Upstairs Dressing Room.” The set published by Takagawa Fusajiro, 1883. The devoted wife Sayohime from Thirty-six Good and Evil Beauties.” She is seen on a rocky outcrop watching her husband Otomo Sadehiko sail away to war. Legend has it that she wept for so long that she eventually turned to stone. 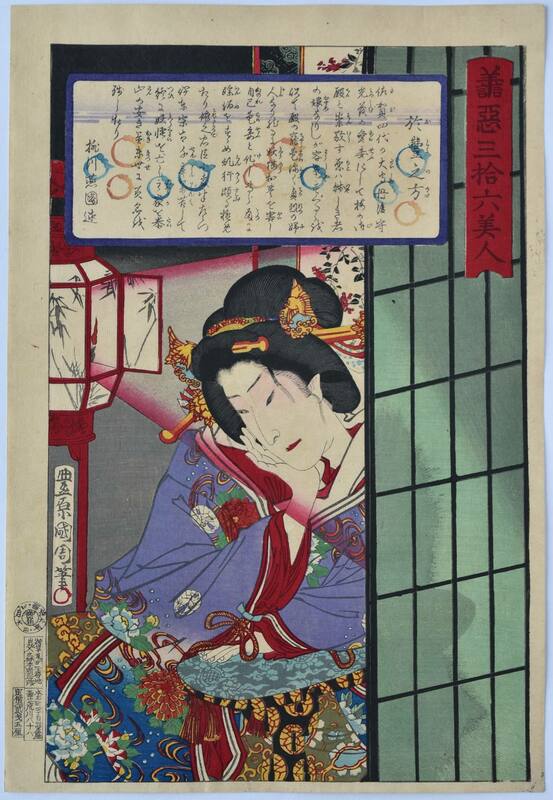 The figure being referred to as Bofu-seki, “Weeping-wife Stone.” Published by Fukuda Kumajiro, 1876. Very fine impression of the first edition . Small backed wormhole top margin and small thinned area, otherwise fine condition. Signed Yasohachi Kunichika hitsu. 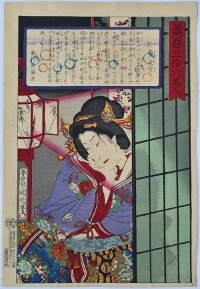 Otoyo no Kata from Zen-aku sanjuroku bijin, “Thirty-six Good and Evil Beauties.” The set published in 1876 by Morimoto Janzaburo. Fine impression, colour and condition. Signed Toyohara Kunichika hitsu. Ichikawa Danjuro IX as the Chinese pirate from Fuzhou (Fukushu kaizoku) shichiso kanteirei from the set: Shiranui monogatari kanto no hitori. 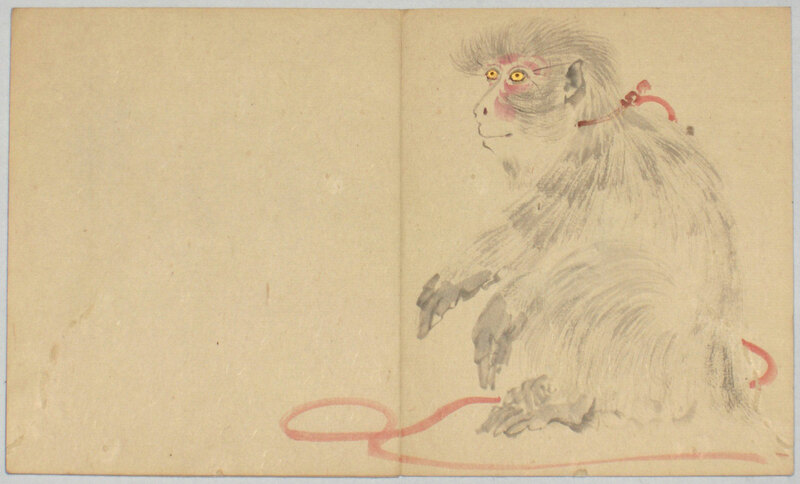 Shiranui monogatari was a picture-book published in three parts from 1849 onwards, written by three authors: Ryukatei Tanekazu, Ryutei Tanehiko II, and Ryusuitei Tanekiyo, with illustrations by Toyokuni III. 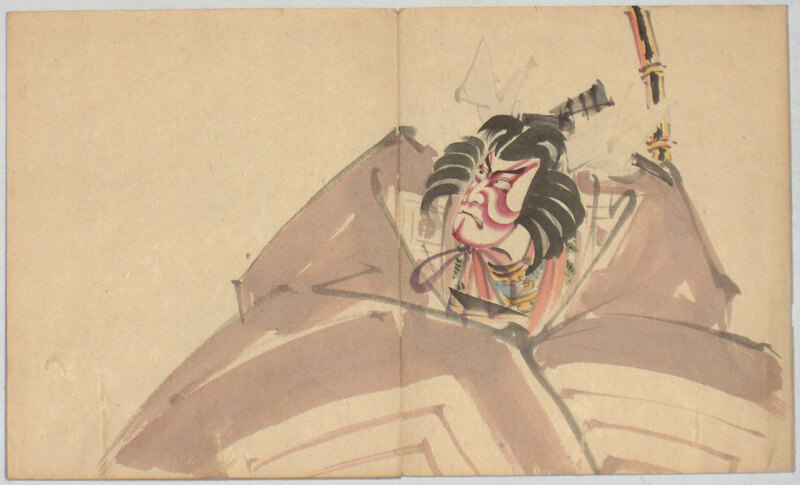 In 1853 it became the subject of a popular Kabuki play. Published by Kobayashi Tetsujiro, 1879. A rare set. Very fine impression, colour and condition with extensive burnishing. 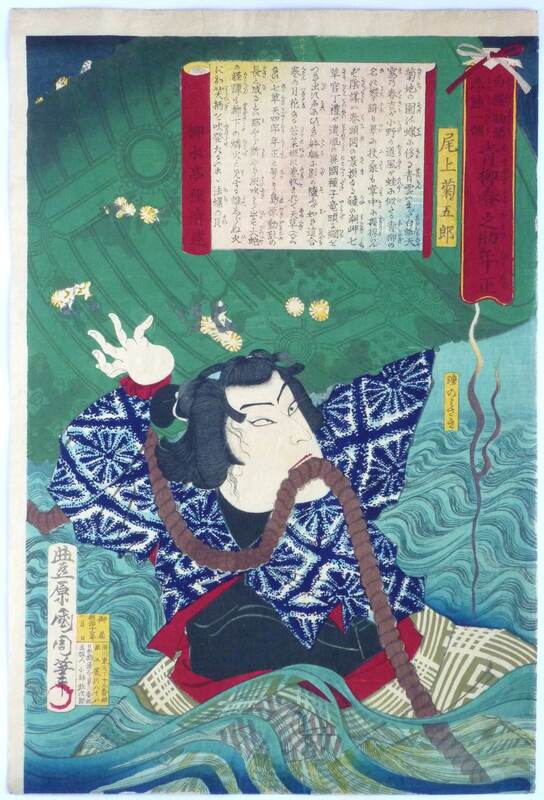 Signed Toyohara Kunichika ga.
Onoe Kikugoro V as Aoyagi Harunosuke Toshitada holding a large bronze bell from the set: Shiranui monogatari kanto no hitori. 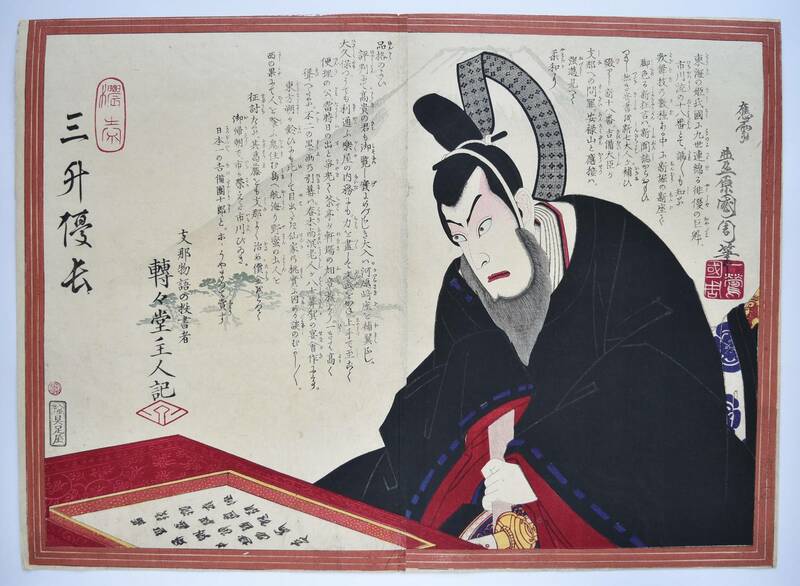 Shiranui monogatari was a picture-book published in three parts from 1849 onwards, written by three authors: Ryukatei Tanekazu, Ryutei Tanehiko II, and Ryusuitei Tanekiyo, with illustrations by Toyokuni III. In 1853 it became the subject of a popular Kabuki play. Published by Kobayashi Tetsujiro, 1879. A rare set. Very fine impression, colour and condition. 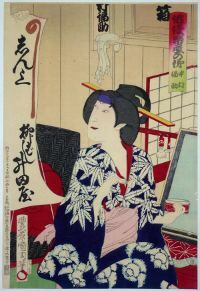 Signed Toyohara Kunichika ga.
A fine set of prints showing actors preparing backstage for their performances. 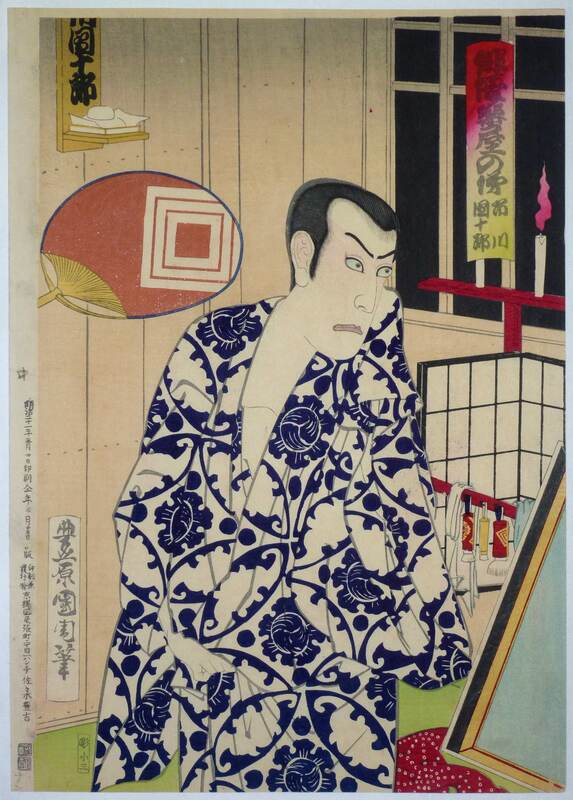 Haiyu gakuya no omokage, “Images of Actors in the Green Rooms.” Here Ichikawa Danjuro IX is shown in dressing gown being fanned by an attendant (off picture). Published 1888 by Sasaki Toyokichi. A fine set of prints showing actors preparing backstage for their performances. Haiyu gakuya no omokage , “Images of Actors in the Green Rooms.” Here Nakamura Fukusuke IV is shown preparing to put on makeup while an attendant (off picture) holds up what is presumably a supporter’s banner. Published 1888 by Sasaki Toyokichi. 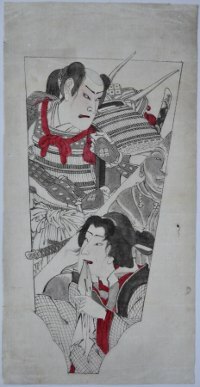 A triptych of the famous scene from Meiboku Sendai hagi “The Disputed Succession” showing Kawarasaki Gonjuro I as Arajishi Otokonosuke and Onoe Kikugoro V as Yoshio. The rat with the scroll of conspirators is attacked, escapes, and reappears through a trapdoor in its true guise as the evil Nikki Danjo. Published by Tsujiokaya Bunsuke, 1869. Fine impression, colour and condition. Signed Kunichika hitsu. A vertical oban triptych showing Onoe Kikugoro V as Okiku’s ghost, above, and Ichikawa Danjuro IX as Asayama Tessan from the play Sarayashiki kesho no sugatami, “Mansion of Plates” performed at the Kabuki-za 1892. A famous ghost story with different versions. The gist is that Okiku was a maid at the mansion of the samurai Aoyama Tessan. He attempts to seduce her without luck and as an act of revenge hides one of ten valuable Dutch plates, claiming that she has stolen one. In remorse, she drowns herself in a neighbour’s well. Her ghost appears every night, sobbing and groaning, eventually causing Aoyama to go insane. Published by Fukuda Kumajiro, 1892. Superb impression, colour and condition. Signed Toyohara Kunichika hitsu. 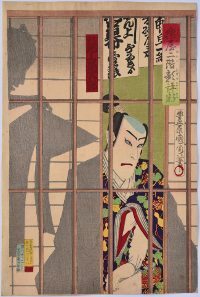 A vertical diptych showing the actor Onoe Kikugoro V in the role of Komamonoya Saijiro, “Saijiro of the haberdashery store,” fighting a giant serpent in the play Inaba Kozo ame no yobanashi performed at the Nakamura-za theatre in 11/1887. Published by Fukuda Kumajiro, 1887. Evidently the actor was swallowed whole during this scene ! An extremely rare print. Fine impression and colour. Extensive mica on the serpent’s head and body. Fine condition with the publication details intact on the left margin. Ample room for joining the two sheets. Signed Oju Toyohara Kunichika hitsu. A full-on image of the actor Ichikawa Danjuro IX as Kamakura Gongoro Kagemasa in the Shibaraku play with the voluminous costume associated with the role. 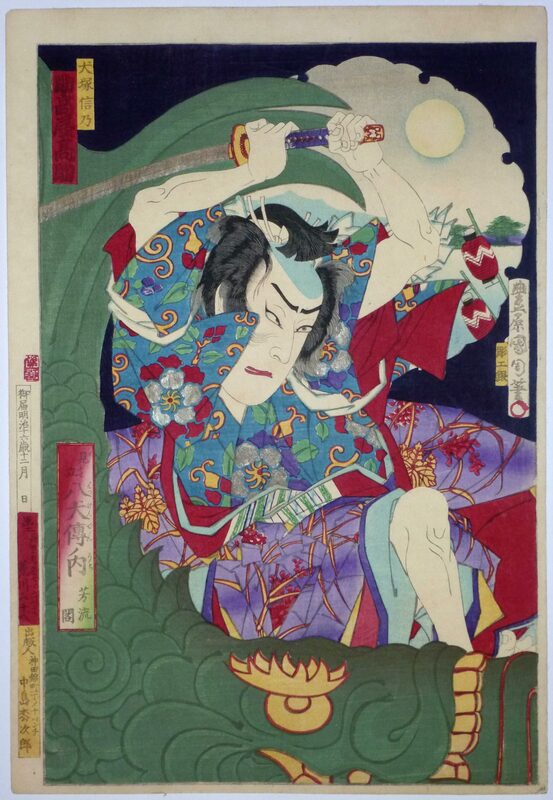 Title: Kabuki juhachiban no uchi/Shibaraku, “The Eighteen Famous Kabuki Plays:Shibaraku.” Kunichika made a number of prints, single, diptych and triptych, of this subject but this particular design is rare. Published by Mizuno Asajiro, c. 1895. Very good impression and colour. Background partly blind-printed. Slight trimming losing publishing information on left edge of last sheet and slight soil. Otherwise good condition. Signed Oju Toyohara Kunichika hitsu. 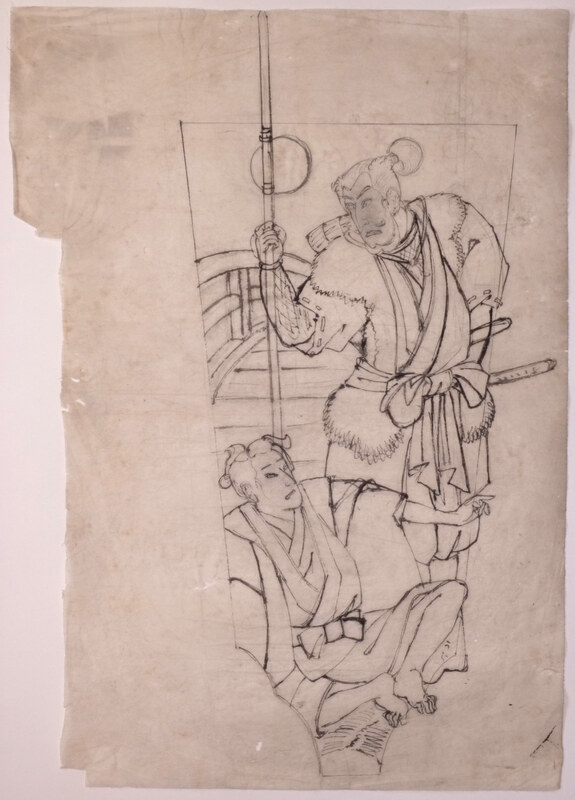 An original hanshita-e drawing showing actors in different roles; above as a warrior and beneath in an onnagata role. Sumi and red on thin paper. 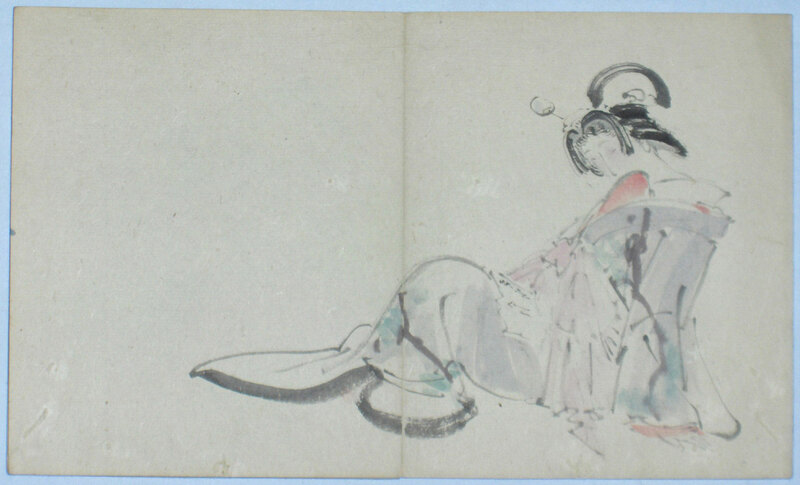 Image size 12.5 x 6 in, 31.5 x 15 cms. . For a series of designs contained within a hagoita ( wooden paddles used to play the New Year hanetsuki game ). Good condition. 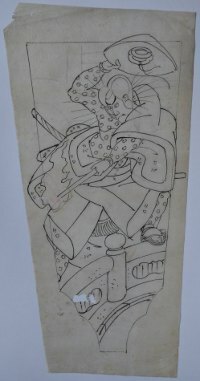 An original hanshita-e drawing possibly showing Kagekiyo breaking prison. Sumi on thin paper. 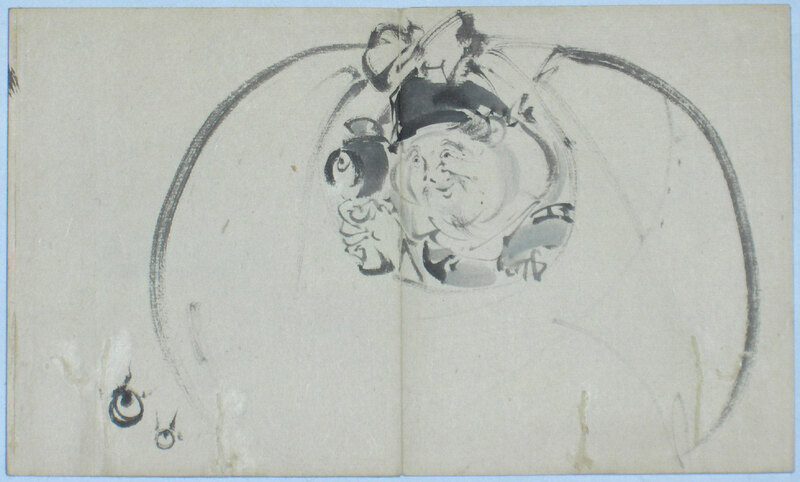 Image size 13 x 6.5 in, 33 x 16.5 cms. . For a series of designs contained within a hagoita ( wooden paddles used to play the New Year hanetsuki game ). Numerous indications for the printer for the colours to be used. One hole, otherwise good condition. An original hanshita-e drawing probably showing Danjuro IX as Benkei. Sumi with light touches of pink and blue on thin paper, image size 12.75 x 6.5 in, 32.5 x 16.5 cms. For a series of designs contained within a hagoita ( wooden paddles used to play the New Year hanetsuki game ). In good condition. 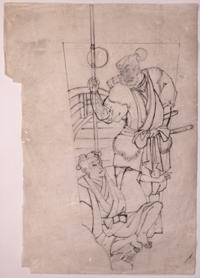 An original hanshita-e drawing probably showing Benkei and Yoshitsune on Gojo Bridge. 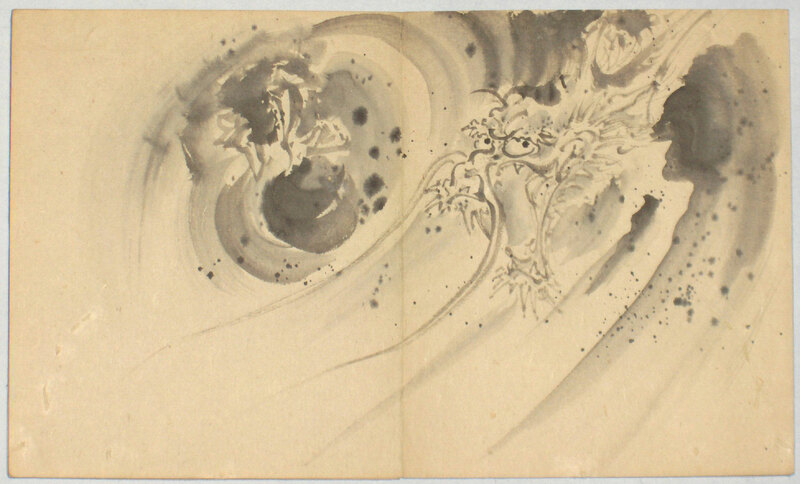 Sumi on thin paper, image size 14.5 x 6.25 in, 37 x 16 cms. For a series of designs contained within a hagoita ( wooden paddles used to play the New Year hanetsuki game ). Some creasing. 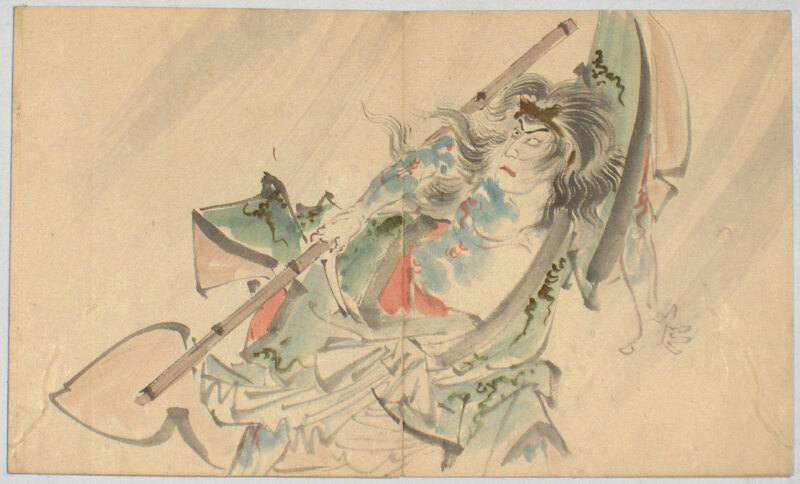 An original hanshita-e drawing showing an actor in an onnagata role. Sumi on thin paper. 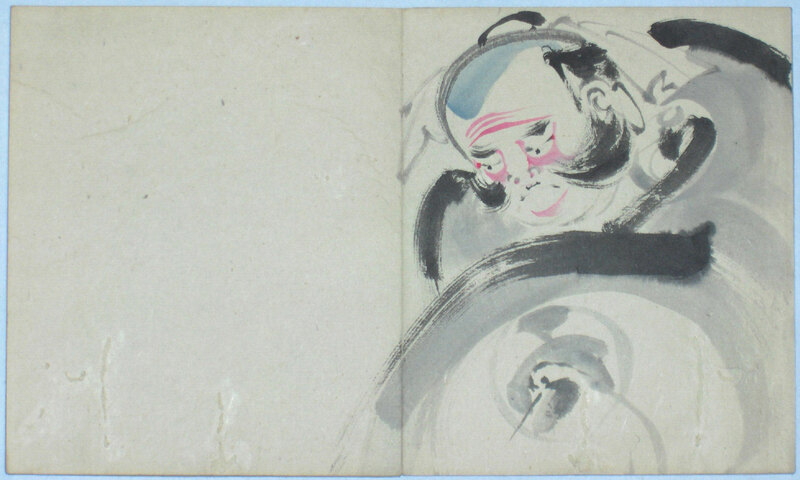 Image size 12.5 x 6 in, 31.5 x 15 cms. . For a series of designs contained within a hagoita ( wooden paddles used to play the New Year hanetsuki game ). Numerous indications for the printer on the colours to be used. Good condition. 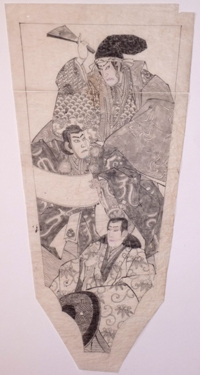 An original hanshita-e drawing showing three actors in various roles. Sumi on thin paper. Image size 12.5 x 6 in, 31.5 x 15 cms. For a series of designs contained within a hagoita ( wooden paddles used to play the New Year hanetsuki game ). Paper separated at top, otherwise good condition. An original hanshita-e drawing showing actors in different roles; the one above as a warrior, and beneath as a commoner. Sumi and touches of red on thin paper. Image size 14 x 6 in, 35.5 x 15 cms. . For a series of designs contained within a hagoita ( wooden paddles used to play the New Year hanetsuki game ). Good condition. 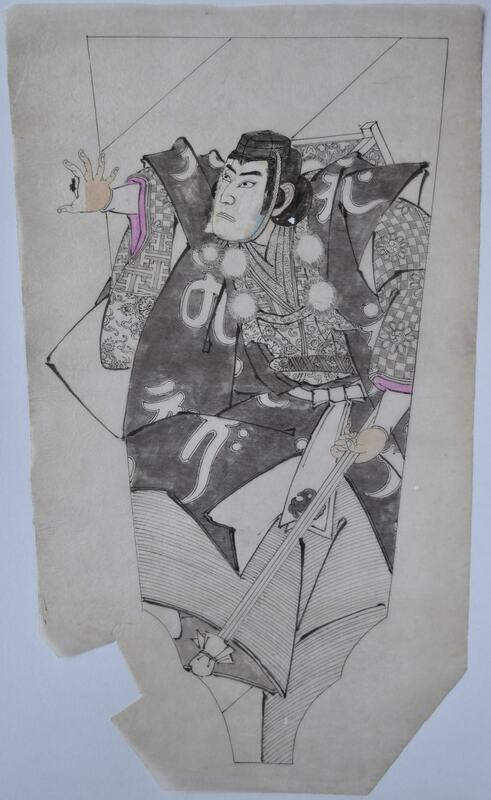 An original hanshita-e drawing showing an actor with sword raised and voluminous red hair. Sumi and red on thin paper, image size 11.5 x 5.75 in, 30 x 14.5 cms. For a series of designs contained within a hagoita ( wooden paddles used to play the New Year hanetsuki game ). Numerous indications for the printer on the colours to be used. In good condition. 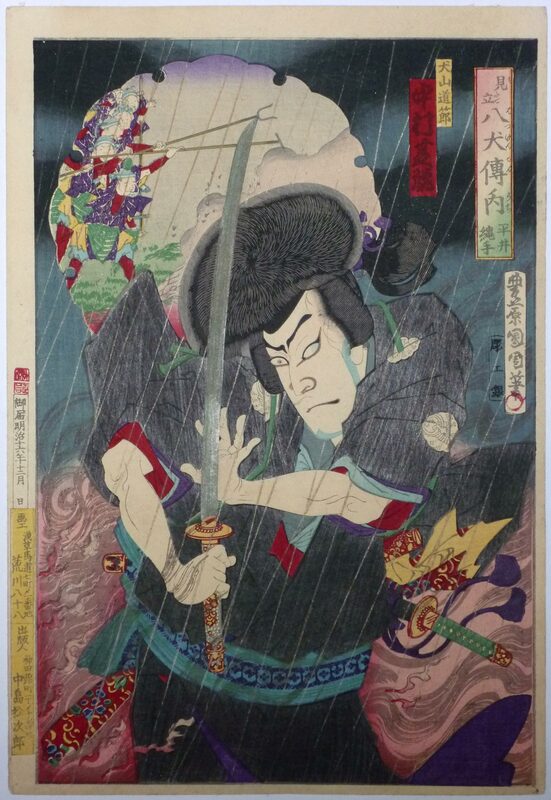 Suketakaya Takasuke IV as Inuzuka Shino on the roof of the pavilion Horyukaku fighting Kenpachi. 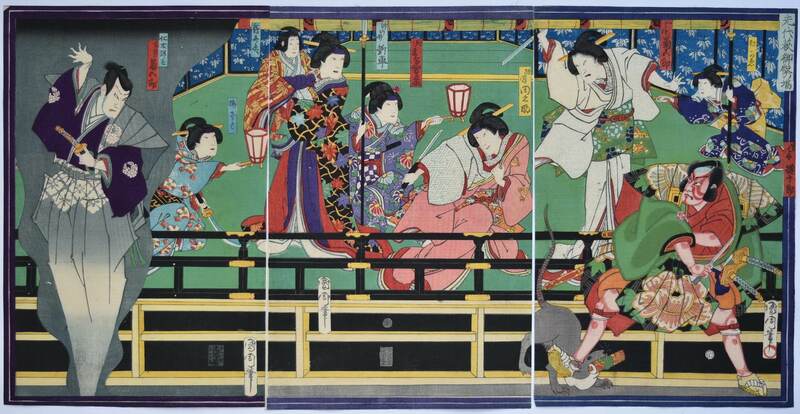 A fine set based on Bakin’s Hakkenden, entitled “A Parody of the Hakkenden” published by Fukuda Kumajiro, 1883. A rare series that shows, even at this late date, there are flashes of brilliance. Very fine impression of the first de-luxe edition with silver and beautiful bokashi. Fine colour and condition. Full size. Signed Yasohachi Kunichika hitsu. Nakamura Shikan II as Inuyama Dosetsu battling with Inukai Kenpachi. 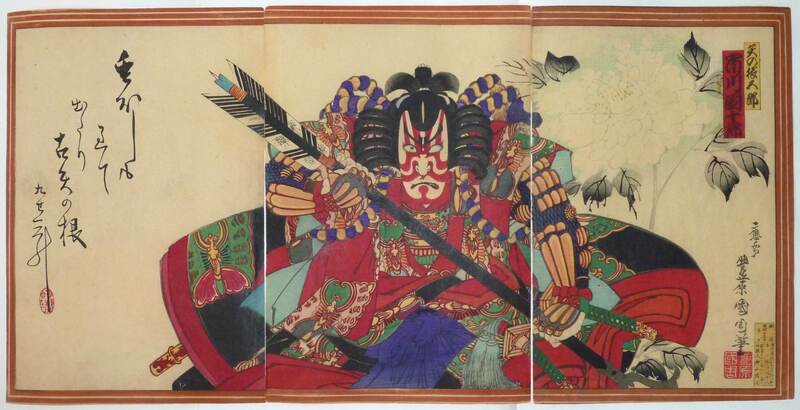 A fine set based on Bakin’s Hakkenden entitled “A Parody of the Hakkenden” published by Fukuda Kumajiro, 1883. A rare series that shows, even at this late date, there are flashes of brilliance. Very fine impression of the first de-luxe edition with extensive burnishing and silver. Fine colour and condition. Full size. Signed Yasohachi Kunichika hitsu. 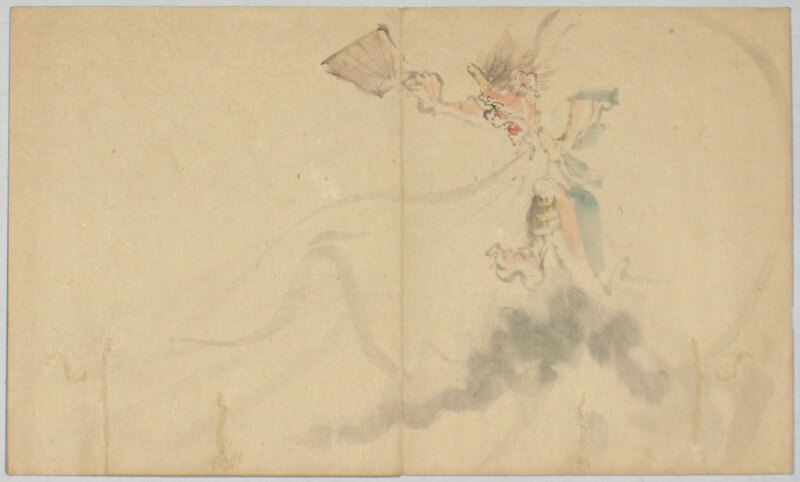 Aoi, Chapter 9, from Genji goju-shi jo, a parody series of the tale of Genji ( ie the 54 Chapters of Genji Monogatari, a 10th century romance by Murasaki-Shikibu. ) 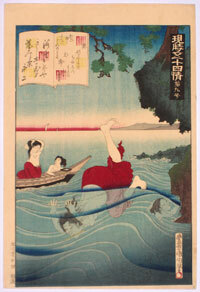 Shows ama, female divers, collecting awabi, “abalone”, on the coast of Ise. 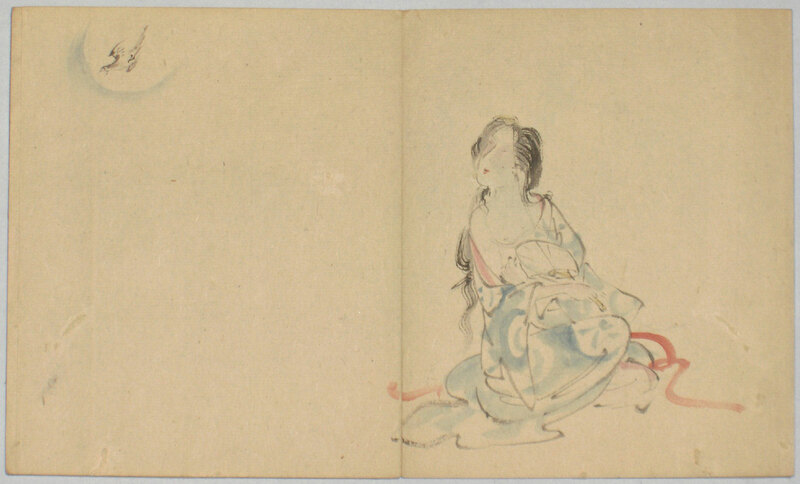 This is the best design from the set and was a popular subject with ukiyo-e artists as the women were considered quite risqué for obvious reasons. Published by Takekawa Seikichi, Meiji 17 ( 1884 ). Fine impression, colour and condition. Signed Toyohara Kunichika fude. 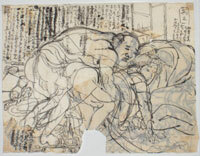 A vigorous original preparatory drawing by Kunichika for an aiban shunga print. 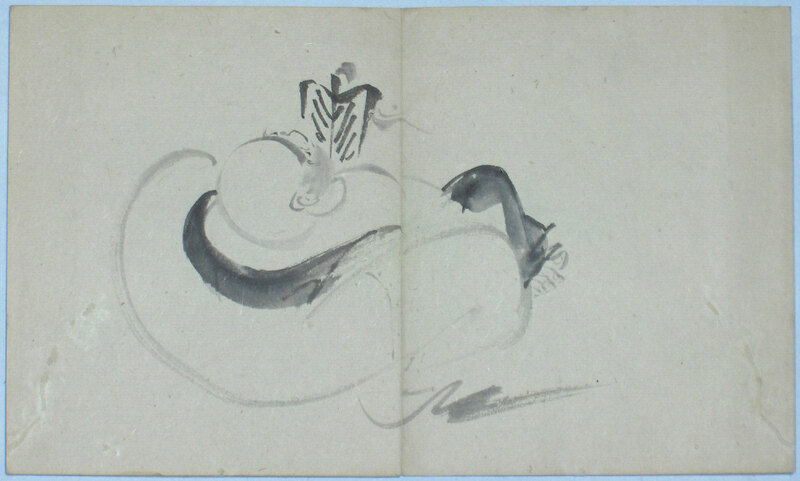 Sumi on thin tissue with extensive pentimenti ( giving an alternative position for the female ). 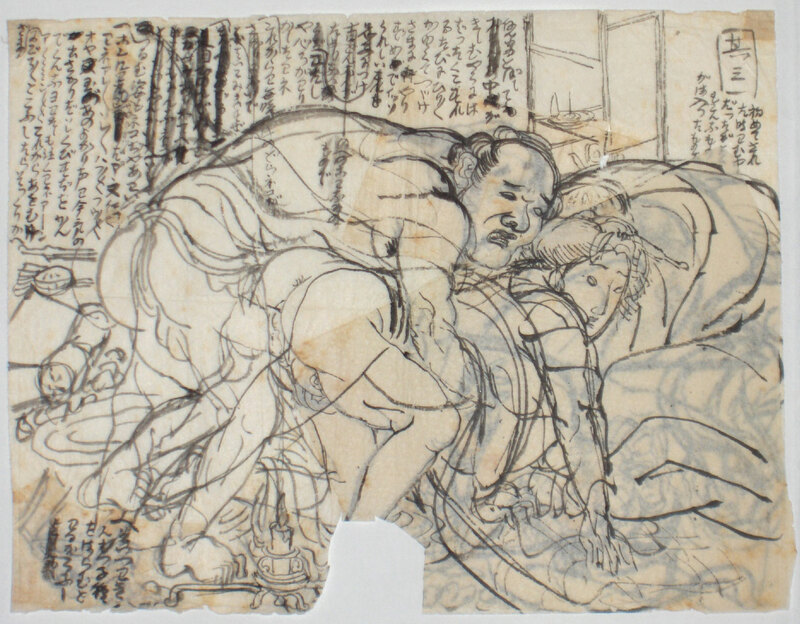 Such shunga drawings are rare. 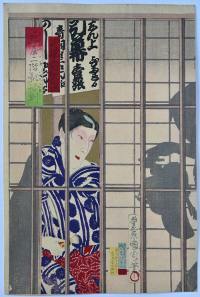 A vertical diptych showing Onoe Kikugoro V as Nikki Danjo transforming himself by majic into a rat. In his mouth the stolen will with which he was trying to strip Tsuru-chiyo of his inheritance. Title of play: Meibuku Sendai hagi, “The Disputed Succession.” Published by Fukuda Kumajiro, 1887. Rare. Fine impression. Very good colour. Some burnishing. Slight offsetting and oxidation. Retains original album backing. Signed Toyohara Kunichika hitsu. 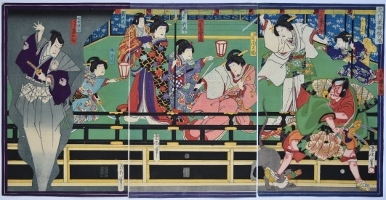 A vertical diptych depicting the story of the Inaba Apprentice. Title: Inaba ama-yobanashi. Shows Onoe Kikugoro V as the ghost of Saijiro; Bando Kakitsu as Kanbara Mikinosuke and Onoe Matsukuke as Nakama Gonbee. Published by Fukuda Kumajiro, 1887. Extremely rare. Fine impression and colour. Hand-applied pigment to the head of the ghost. Some silver and burnishing. Retains original album backing. Signed Oju Toyohara Kunichika hitsu. A vertical diptych showing the actor Onoe Kikugoro V, dagger in hand and covered in blood, confronting a giant serpent. Published by Fukuda Kumajiro, 1887. Extremely rare. Fine impression and colour. Extensive mica applied to the serpent. Retains original album backing. Signed Oju Toyohara Kunichika hitsu. 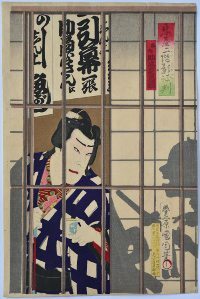 A vertical diptych showing the actors Ichikawa Danjuro as the teacher Kondo Tatsuo and Ichikawa Sadanji as Mikura Tomizo. Title: Kishu no oki kisen chinbotsu no ba, “ Sunken Ship in the Sea off Kishu Province.” Published by Fukuda Kumajiro, Meiji 20, 11th month ( 1887 ). Fine impression and colour. Extensive mica and gofun applied. Retains original album backing. Signed Oju Toyohara Kunichika hitsu. 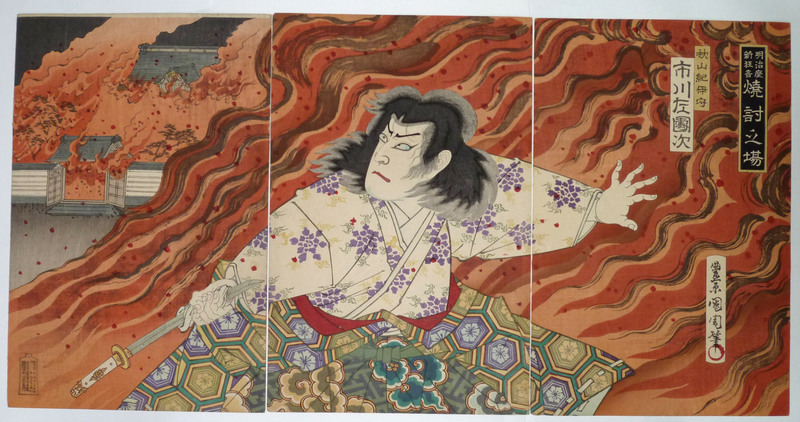 A vertical diptych showing the actor Onoe Kikugoro V in the role of Komamonoya Saijiro, “Saijiro of the haberdashery store,” fighting a giant serpent in the play Inaba Kozo ame no yobanashi performed at the Nakamura-za theatre in 11/1887. Published by Fukuda Kumajiro in 1887. Evidently the actor was swallowed whole during this scene ! An extremely rare print. Fine impression and colour. Extensive mica on the serpent’s head and body. This is the only impression of this design I have seen retaining the publication details in the left margin ( albeit even here slightly trimmed ). Very good condition. Ample margin for joining the two sheets. Signed Oju Toyohara Kunichika hitsu. 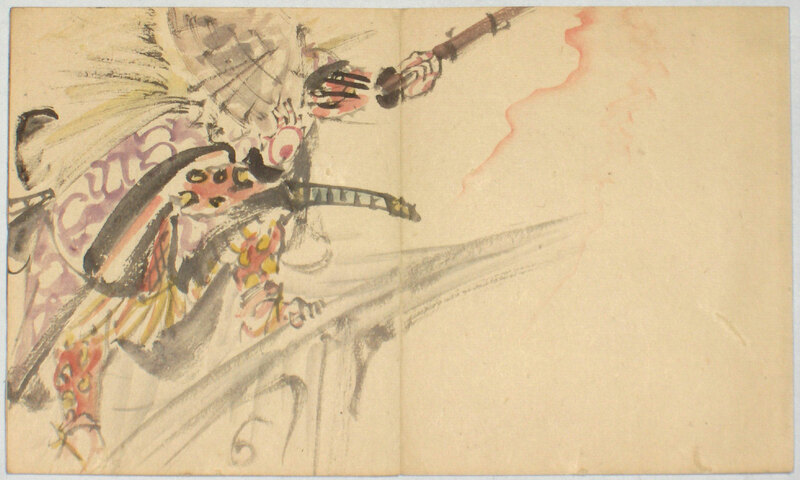 The actor Ichikawa Sandanji I as Akiyama Kiimori holding a sword amidst a conflagration. Yakiuchi no ba from a set Meijiza Shinkyogen, “New Plays for the Meiji Theatre.” Although the play is unidentified the house in the background has been set on fire in an attempt to capture the hero Kiimori. Kunichika’s best print in this genre. Published by Akiyama Buemon, 1894. Fine impression and colour. Light album backing, otherwise fine condition. Signed Toyohara Kunichika hitsu. 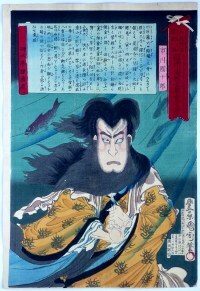 The actor Ichikawa Danjuro IX in shibaraku role. 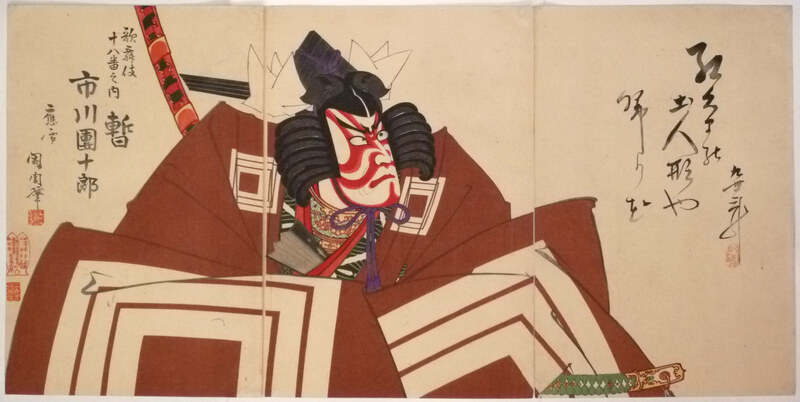 A fine triptych, Kabuki juhachiban no uchi/shibaraku, “The Eighteen Famous Kabuki Plays: Shibaraku.” Published by Fukuda Kumajiro, 8/1895. Fine impression, colour and condition. Signed Oju Kunichika hitsu. A triptych showing Danjuro IX as Yanone (arrowhead) Goro (Soga Goro). Published 1882 by Kamiyama Seishichi. 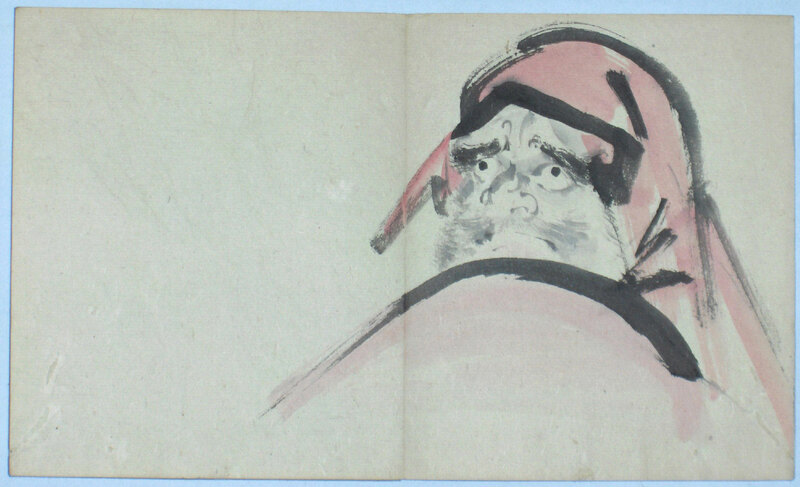 Poem by Sansho the 9th (Danjuro). Very good impression and colour. Slight trimming, otherwise very good condition. 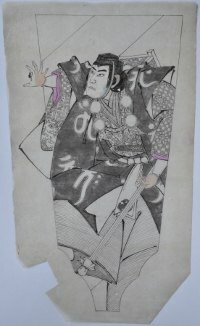 Signed Oju (“by special request”) Toyohara Kunichika hitsu.